No connection? Follow these steps. If your web browser, email program, or any of a hundred other internet-connected apps on your Mac starts complaining about not having a connection, you may have to do a bit of sleuthing to figure out the cause. After all, a disruption anywhere along the chain between your Mac and a distant server could cause an outage, and it’s not always obvious where to look. I suggest trying each of the following steps, in order, until you’re able to connect again. To make sure the problem isn’t restricted to just one website, try visiting another—preferably one that’s highly reliable, such as Google.com. Similarly, to make sure the problem isn’t just your current app (such as your email program or web browser), try connecting to the Internet with another app. If only one site seems to be having problems, try visiting Down For Everyone Or Just Me and entering the problematic site’s URL. The service will tell you whether computers elsewhere on the Internet can successfully connect to the site. The Network Diagnostics utility will guide you through a series of questions and tests, ranging from checking your ethernet or Wi-Fi connection to network configuration and DNS servers. Sometimes the utility can repair problems itself; when it can’t, it usually provides more detailed information about the nature of the problem and offers suggestions for solving it. 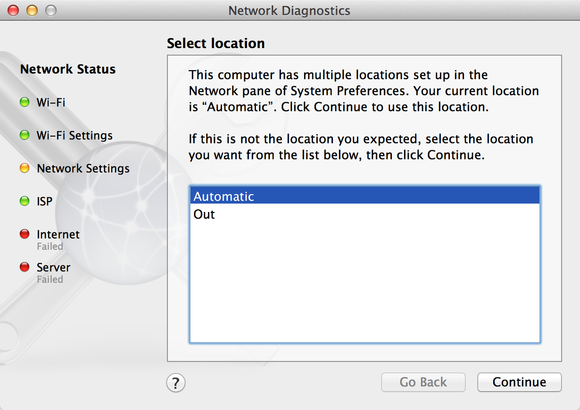 The Network Diagnostics utility built into OS X can track down, and sometimes repair, network connection problems. Check your Wi-Fi menu to make sure you haven't gotten onto the wrong network. If your Mac connects to the Internet via Wi-Fi, check the Wi-Fi menu (at the top right of your screen) to make sure you’re connected to the network you intend to be. Macs have been known to hop onto less-desirable networks at inconvenient times. If the menu’s icon has an exclamation point, indicating that it can’t successfully connect to any network, try choosing Turn Wi-Fi Off from the menu, waiting about 30 seconds, and then choosing Turn Wi-Fi On. If that still doesn’t work, restart your Mac. Sometimes that’s the only way to clear wacky errors that prevent Wi-Fi from connecting. For network problems that lie beyond your Mac, if you own or control the network device your Mac connects to (such as an AirPort base station, Time Capsule, router, switch, or hub), turn that device off, wait about 10 seconds, and turn it back on again. Wait for it to power on completely (sometimes a multistep process that can take several minutes) and try connecting again. If there’s more than one such device between you and the Internet—for example, an AirPort Express connected to a cable modem—start with the one closest to the Internet and then work your way back to your Mac, cycling the power on each one as you go. The Domain Name System (DNS) enables your Mac to convert domain names (like apple.com) into IP addresses (like 17.172.224.47). If the DNS server your Mac uses is offline, slow, or faulty, you may be unable to connect to any site or service by name. Here’s an easy way to check whether DNS is functional if no websites, such as google.com, respond. In your browser, type in this URL: http://74.125.230.243. That should bring up the Google website. If it does, then you know your Internet connection itself is fine and the problem is merely looking up domain names. To fix that problem, open the Network pane of System Preferences and select your network connection in the list on the left. Click Advanced followed by DNS. 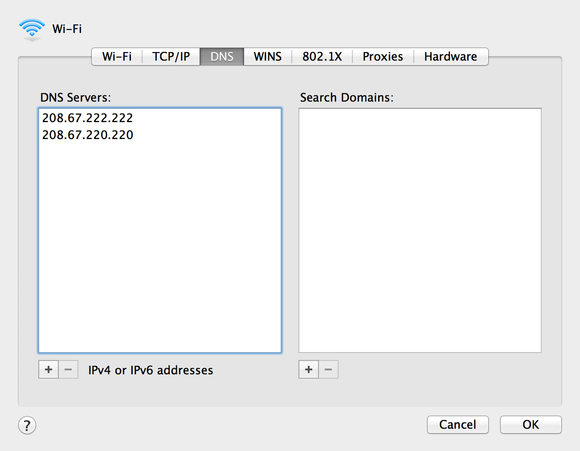 In the DNS Servers field, you should see one or more IP addresses. If those addresses are enabled (black, as opposed to gray), select each one in turn and click the minus-sign (-) button. Then, regardless of whether there are already addresses there in gray, click the plus-sign (+) button and enter 208.67.222.220; repeat with 208.67.222.222. (These addresses point to OpenDNS, a free DNS service that’s often more reliable than the default servers your ISP uses.) Click OK and then click Apply. Now try connecting again. If you suspect a DNS problem is preventing you from connecting to the Internet, try entering the IP addresses for the OpenDNS servers, as shown here. Even after following all these steps, success isn’t guaranteed, because some outages could be beyond your control. Because of the distributed nature of the Internet, an equipment failure at an ISP can affect more than just that ISP’s customers. And on a larger scale, accidental damage to a major fiber optic cable can (and occasionally does) wipe out Internet access to a large region. So, sometimes the only solution to an Internet outage is to wait for it to be fixed. But if the problem lies beyond your local network, your ISP should at least be able to tell you the nature of the problem and an expected repair time.